This week, we find ourselves on the next to last episode of Season 1. This week’s episode may not be as action-packed as last week’s, but there may be a couple new faces added to the mix. You’ll just have to watch to find out what happens. We hope you like you what you see, and we hope to see you back next week for the release of Episode 5 of Renegades, the final episode of Season 1! Companionship….companionship gets you places, intended or not. Axe and Kane are back on the trail, slowly but surely making their way towards Outpost 24, when confronted by an old friend. Like our page on Facebook, and Subscribe to our channel on YouTube to stay in the loop! 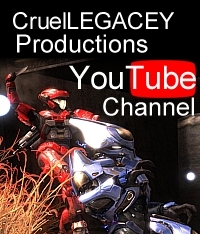 This entry was posted in halo reach, Video and tagged machinima, nuclear taco productions, renegades. Bookmark the permalink.